Americans love their pets. After Spanish authorities euthanized the dog of a nurse who contracted Ebola, many US pet owners became understandably concerned. When news leaked that an American nurse in Dallas with Ebola also had a dog, pet owners really got nervous. The Internet lit up with speculations, myths, and lots of wrong information regarding Ebola virus and animals. Veterinarians, including Dr. Jeff Werber's article Can Ebola Spread to Dogs? and my own Ebola In Dogs piece (among others), did their best to provide accurate and timely information, but blogs and social media can only do so much. Fortunately, the Centers for Disease Control (CDC) published “Questions and Answers about Ebola and Pets” to help assuage fears and dispel rumors. I can’t stress enough that the risk of you or your pet contracting Ebola is incredibly, extremely low. Let’s review the highlights from the CDC report and what you need to know to keep your pet and family safe and worry-free. According to the CDC, Ebola has not been found to be transmitted through the air or in water. Further, "Only a few species of mammals (for example, humans, monkeys, and apes) have shown the ability to become infected with and spread Ebola virus. There is no evidence that mosquitos or other insects can transmit Ebola virus," according to the CDC Q&A. The only scientific study to date on Ebola virus in dogs was conducted by a French research team in 2005. They found that dogs near the 2001-2002 Gabon outbreak had antibodies to Ebola, indicating some form of infection and exposure. These dogs had likely been scavenging on human and animal carcasses infected with Ebola. 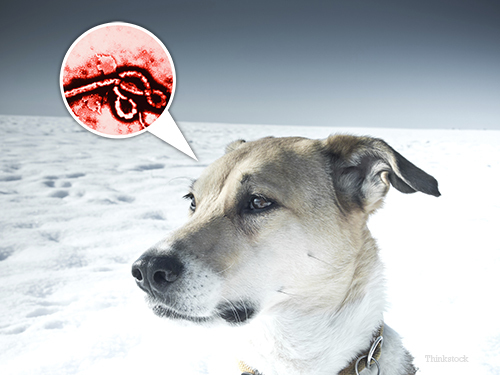 The truth is we know very little about Ebola in dogs. It is very important that we study any pets potentially infected with Ebola to better understand the risks and realities of this deadly disease. 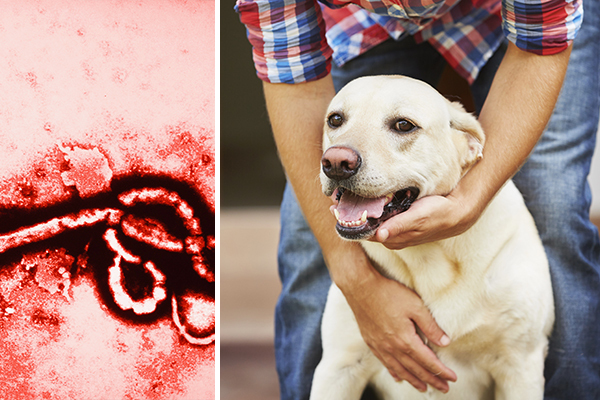 Are dogs and cats in the US at risk of contracting Ebola? Probably not. The CDC rates it as “very low.” Keep in mind that a dog or cat must come into direct contact with the virus through an infected person’s blood or body fluids. Even in Africa, scientists haven’t observed dogs sick with Ebola. Can I get Ebola from my dog or cat? What will happen if another patient has pets? Highly unlikely based on what we’ve learned about Ebola over the past 38 years. We have yet to verify any dogs or cats becoming sick with Ebola or that dogs and cats are capable of spreading the virus to humans. It is my opinion if a pet is living with a person who contracts Ebola, that pet should be quarantined, studied, and closely evaluated for Ebola. The CDC’s new recommendations include a case-by-case evaluation of pets exposed to Ebola patients, stating: "Public health officials in collaboration with a veterinarian evaluate the pet’s risk of exposure to the virus (close contact or exposure to blood or body fluids of an Ebola patient). Based on this evaluation as well as the specific situation, local and state human and animal health officials will determine how the pet should be handled." If a person is infected with Ebola, any pets should be considered potentially infectious and handled using current infection-control protocols. We don’t know if Ebola-contaminated body fluids or blood on a pet’s fur or body can spread the virus to humans. The virus is only able to live for a few hours outside the body so the risk would be minimal. Can pets be flown from West Africa to the US? The CDC, USDA and each state have strict rules and regulations concerning the transportation of animals into the United States. Monkeys and African rodents are prohibited from importation entirely. What animals can spread Ebola to humans? Fruit bats are believed to be the natural carriers of Ebola virus and pose a high risk to humans. Primates, especially gorillas, monkeys and chimpanzees, have been associated with several Ebola outbreaks in the past. Antelopes and porcupines found in West Africa can also carry the virus. Dogs and cats are not currently considered to be carriers capable of transmitting Ebola to humans. Should I be worried about Ebola in my pet? No. The only reason you should be concerned is if you’ve recently traveled to an Ebola outbreak area, contract Ebola and begin to show symptoms. If you’re a healthcare worker treating Ebola patients, take normal precautions and use best practices for infection control. The United States has the greatest healthcare system in the world. That doesn’t mean we shouldn’t be vigilant about Ebola; it means there’s an entire network helping keep us and our pets as safe as possible. Can Ebola Spread to Dogs and Cats?